Last week we were treated to back-to-back shutouts from Brandon Morrow and Henderson Alvarez. Buck Martinez and Pat Tabler were quick to point out that the Jays had not pitched back-to-back shutouts since September of 1988 (it was Dave Stieb and Jimmy Key). I couldn’t even remember the last time a Jays pitcher even threw a complete game (it was Ricky Romero, August 18th, 2011). 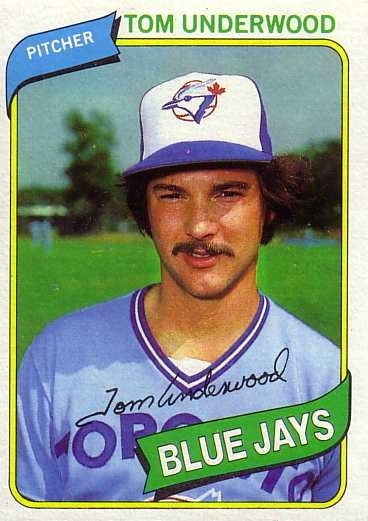 In fact, the Blue Jays only threw 7 complete games as a team in 2011. In Roy Halladay’s final year in Toronto – 2009 – he threw 9 complete games by himself. To be clear, this isn’t another post bemoaning the advent of pitch counts and pitchers being treated with kid gloves. However, Blue Jays manager John Farrell stated this season that in order for this team to contend in 2012, his starting staff is going to have to find a away to go deeper into games. The Blue Jays have blown 7 games by the bullpen so far this season, so it’s clear that this is a true statement. We’ve got the usual suspects at the top of the list, but of course, all of these guys pitched in a different era. Dave Stieb once pitched 288 innings in a season. Doyle Alexander pitched 261. Even Pat Hentgen pitched nearly 266 innings in his Cy Young season of 1996. If any members of today’s young starting staff were to approach those numbers the knives would be out faster than you could say “Coco.” There has been a paradigm shift in baseball: pitchers are generally limited to 100 pitches per game and ~200 innings per year. As a result, complete games are few and far between. But it’s not impossible to go deep into games while pitching the lower-end of 200 innings. Jesse Jefferson finished off 9 of his 30 starts in 1978 and only pitched 211 innings. Luis Leal finished 7 games in 217 innings in 1983 while making 35 starts. 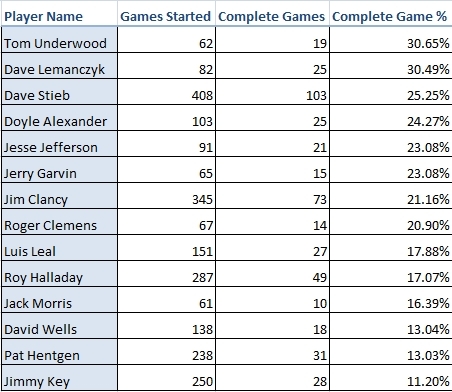 Admittedly, complete games are not the barometer by which the ability for a pitcher to go deep into games should be measured, but it is interesting to note that not one person (not named Halladay) on this list who has completed 15% of their career starts had thrown a single pitch in the 2000s (as for Roger Clemens… we’ll call him an outlier). *SSS ALERT: Small Sample Size Alert. This list looks pretty dismal compared to the Blue Jays’ all time leaders, but really, it’s actually not so bad. This season, the Blue Jays are tied for 2nd in baseball in complete games thanks to the back-to-back shutouts from Morrow and Alvarez. But what was most impressive about Morrow and Alvarez’s CGs was their pitch efficiency. Morrow threw 102 pitches in his CG; Alvarez needed only 97. If they continue limiting themselves to only 10-15 pitches per inning, they will take this team far. Even last season the Jays pitchers did well finishing games – they tied for 6th with Minnesota with those 7 complete games. Since May 1st, Jays pitchers have averaged nearly 7 innings pitched per start (at the time of filing this post). Not bad when you consider Hutchison has 4 career starts to his name. While it is clear that the days of Blue Jay pitchers finishing one out of every three starts are behind is, it appears that the kids in the Jays rotation are doing alright. Photo of Dave Stieb rockin’ out on his guitar courtesy of Ashley Stieb.